The Forum on Men in Black or White: History as Media Event in Singapore was held at the National Library of Singapore on 16 January 2010, and was jointly organised by the Asia Research Institute and National Library Singapore. It attracted a full house audience of members of the public and the academe, and represents ARI’s endeavours to foster an environment of public discussion of vital academic issues in Singapore. Professor Chua Beng Huat, the organiser of the event, gives an account of the main themes and audience reaction to the forum. The publication of Men In White: The Untold Story of Singapore’s Ruling Party (by Sonny Yap, Richard Lim and Leong Weng Kam, Straits Times Press), in August 2009, created much excitement among Singaporeans who have for five decades been waiting for the ‘full’ story of politics of Singapore of the 1950s and 1960s to be told. Hitherto, they have only been fed the version of the victors, culminating in the memoirs of Lee Kuan Yew, leader of the winning half of the original People’s Action Party (PAP). This victor’s version, having been taught in primary school, repeated in secondary school, thematised in television dramas and finally, paraded in the national museum, has wide currency but it is also tired and draws heavy doses of skepticism from all quarters. The book’s subtitle promises untold stories, first-hand accounts, from the PAP’s left-wing comrades who were marginalised, detained, deported and otherwise vanquished, by the winning half that came to dominate Singapore’s parliamentary politics since 1968. The voices that until now have not been allowed to speak for themselves, appearing as ‘national villains’ in ventriloquist speeches of the victors, are now to be heard for the first time. The excitement was completely understandable. Three journalists, Sonny Yap, Richard Lim and Leong Wang Kam, on paid leave from The Straits Times (Singapore Press Holdings), were to undertake the writing of presumably the full story of the rise of the PAP. Supported by a team of researchers, they combed sixty years of archives and spent endless hours contacting, wherever they can still be found, cajoling and persuading the suppressed individuals to speak their versions of the PAP’s history. As this history continues till today, the book covers the founding of the Party till the present government. However, much of the excitement among readers was focused squarely on the political intrigues of the first decade. Such a publication rightly deserved public discussion and debate. 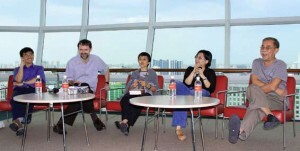 The online journal S/PORES: new directions in Singapore studies and ARI agreed quickly to hold a public forum, in partnership with the National Library Board. The Forum was held on 16 January 2010, at The Pod, the National Library Building. The Forum invited three speakers, Dr Hong Lysa, an independent historian well recognised in Singapore; Mr Tan Tarn How, Senior Research Fellow at the Institute of Policy Studies, Lee Kuan Yew School of Public Policy; Associate Professor Philip Holden, Department of English Literature and Language; and chaired and moderated by Dr Sai Siew Min, Department of History, all from the National University of Singapore. It drew a full house audience. Tan, an ex-journalist of The Straits Times, focused on the launching and publishing of the book as a ‘media event’. He drew attention to the conundrum that the publisher of the book is at the same time publisher of the national newspapers, in all four official languages, that were creating the media buzz, with news items on the launch — featuring on the front page and inside photographs of the, not surprisingly, ‘happy’ gathering, if not amounting to ‘reunion’, of the past enemies — excerpts, editorials and letters to the forum, critiques and rejoinders of the journalists/ writers. Meanwhile other books on broadly similar topics, including those written by previous political detainees themselves, such as The Fajar Generation: The University Socialist Club and The Politics of Postwar Malaya and Singapore, received hardly a mention in the premier national press. The very explicitly male dominance and patriarchy of the title could not escape critical attention, even when one of its obvious pop cultural references is the comedy film, ‘Men in Black’, starring Will Smith. Philip Holden noted the underplaying of women’s contributions, in leadership and at the grassroots, in the years of decolonisation, in the book. Even prominent women politicians who made it to the ranks of Ministers of State were not mentioned. Furthermore, the characterisation of women on the scant occasions that they appear are always less than celebratory; for example, in the depiction of the 1950s Chinese middle school student activism, the ‘pigtails’ of protesting Chinese middle school girls were duly noted, but not the boys with their baggy short pants. One could ask, further, do the ‘Men in White’ include the expelled leftwing members of the PAP, who before their expulsion also wore the same white uniform. Detailed comments on the text were provided by Hong Lysa, displaying her thorough familiarity with the more than 600-page book, which she confessed to have read four times. She pointed out a central problem in both the book and what might be called the ‘official’ narrative of highly ‘organised’ connections between the communists who had infiltrated the open political sphere and those who worked in the shadows. At the various points in the book, the writers, repeating the interviewees/actors words, suggest that coordination between the two groups practically did not exist, let alone suggesting a tightly organised front. Of greater general importance is why the book, and by implication the present PAP government, need to continue with the ‘anti-communist’ narrative even when it is now evident that most of those who were labelled ‘communists’ were admittedly leftwing, partly a reflection of the politics of the time, but not card-carrying members of the Malayan Communist Party. The question-and-answer session that ensued focused on the relevance of the PAP’s early history to particularly the younger generations, the tendency towards ‘being heroic’ among the historical actors, both victors and vanquished, of the decolonisation period and, the need for ARI to be more attentive to other voices and other books in its seminars and forum series. Chua Beng Huat teaches sociology and cultural studies at NUS and travels frequently in Asia in conjunction with work on Inter-Asia Cultural Studies journal, of which he is a co-executive editor.